Everyone in our house loves Bear (adults included) and to receive this disc was just the bees knees. In it we find four great episodes involving all the singing and dancing that you could imagine slinging at your young ones in the 96 minutes that this runs for. Now I am sure that many of you reading this would also watch the show on ABC and for you there is not going to be a lot in the way of surprises. I had seen almost all of these before, but the thing that we are focussing on for this review is the fact that they have been collected for the first time for our little ones to enjoy in one hit. The entire disc is a non stop fun filled series of song and dance that starts with Treelo looking for somone to dance with and our favorite lemur is determined to find everyone and get them bopping away, even Bear gets involved when he feels a twitchin', itchin', scritchin' and scratching as it's time to do the Bear Cha Cha Cha! The kids will love all the different dances that these characters get up to and I found that my kids were all over the place dancing to the catchy tunes, it was so much fun that they dragged their mum and dad along as well! There is also an episode where we listen to the music of sounds around us made by nature. Bear also gets the others in the Big Blue House and us to help with bear cub Ojo's Orchestra. All things said and done I can highly recommend this disc for any family with kids aged from about one to five. It's fun, infectious and a absolute hoot. We loved it and we are sure that you all will too. 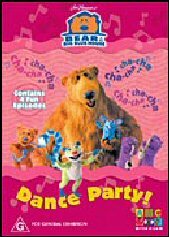 Get dancing with Bear today. *NB* One gripe I have added as an afterthought to this review is that ABC DVD really need to stop with the huge ads before their main feature. You cannot skip them and the kids just want to watch whatever show it is that you have bought for them. Make your ads extras on the disc. They get annoying and parents do NOT want to have to wait for your ads to finish before they can play the feature for their kids. This disc uses 4:3 ratio which is exactly what the toddlers need, nice and bright images filling the whole screen up and the picture is nice, clear and clean. Stereo Audio. No audio problems on this disc. The kids are going to love it. None on this disc. You can either select to play all the episodes or episode select.